Explore Istria by bike on this cycling holiday. Cycling consists of a number of different pleasures, one of them is to experience the unique sense of closeness to nature and the local culture as you ride through it. From the biker’s perspective, the surroundings of the stunning medieval and intact coastal towns of Poreč and Rovinj look like a series of idyllic landscape sketches. You will be passing by olive groves, vineyards, wind your way through parks, forests, undisturbed lush Mediterranean vegetation whose sight and perfume fill your senses. And the sea is never far, it is usually hard to say where the green turns into blue. You shall come across Roman amphitheatres, wonderful frescoed church, quaint village medieval squares and Byzantine basilicas. The Istrian cuisine is a wonderful mix of Italian style dishes with the flavours or Croatia. During the day arrive at the lovely village of Fazana. Now you shall start to feel relaxed as you unwind with a walk through the pretty village. During the late afternoon, you shall have a bike fitting with a welcome introduction of biking programme. 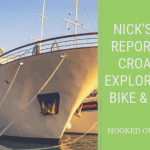 Day 2 Loop ride to Pula and/or day boat trip to the Brijuni National Park. 11-20 miles 18-32km. Today you shall start your bike adventure with a short easy warm-up ride to the town of Pula. Be amazed as you cycle around a warren of marbled alleys. Visit the beautifully preserved amphitheatre dating from 27 BC. After your ride, you can board a boat to the Brijuni National Park. This along time ago used to be the President Tito’s private island archipelago. Here you can explore the Roman villas and the Byzantine villages, admire the herds of deer, pine-fringed bays and Tito’s personal zoo. Day 3 Vodnjan loop ride 12-24 miles, 19-38km. Today you will cycle inland to the town of Vodnjan which was the Istrian ancient capital where you will find a mix of Baroque, Gothic and Renaissance architectures. After a nice break and maybe lunch you shall cycle back along the coast, passing remains of Roman baths on the shore until you return back to the village of Fazana. After breakfast, you leave Fazana by bike and head north towards the charming sea town of Rovinj. A gentle ascent will take you to the small town of Bale, also known as the Roman stronghold of Castrum Vallis, built by the Romans to help defend the saltpans and the roads that connect to and from Pula and Porec. You have a chance of an optional guided tour of the city of Rovinj. Day 5 Day at leisure to spend in Rovinj or Northern loop ride 11 miles 17 km. Today you have a choice. You can spend a day relaxing on one of the sunny bays of Rovinj or visiting its nice boutiques, galleries or historical monuments. If you like you can also go for a boat day trip to Venice! Alternatively, you can opt for a short easy loop ride, passing ruined churches and olive groves. On the way back stop for a swim on one of the rocky bays. Day 6 Ride from Rovinj to Porec 28 miles 45km. Today you shall start cycling inland to an impressive wooded valley of the Lim Fjord. Now a little undulating you soon reach a beautiful panoramic view which makes the small effort worthwhile. Now after a short break for lunch, continue your cycle tour to Porec which is a historic town located in the small peninsula of San Nicholas. Now you can visit its magnificent historical palaces, the “House of the two Saints” and the popular UNESCO Heritage Basilica of Euphrasian. Day 7 Loop ride from Porec via Tar and via the Jama Baredine Caves 20 miles 32km. Now today you cycle along the shoreline as you head towards the fertile plateau of Tar passing by the Larun olive plantations, said to produce Europe’s best olive oil. Now you shall loop back inland where you can visit the giant limestone Cave of Jama Baredine. Then you can cycle back to Porec and enjoy your last Istrian evening enjoying a glass of home-made brandy in the terrace of the hotel overlooking the sea. Our services end after breakfast! By plane to Pula and by taxi or bus to Fazana. You can also fly into Venice and take the ferry to Porec and then a bus to Fazana.